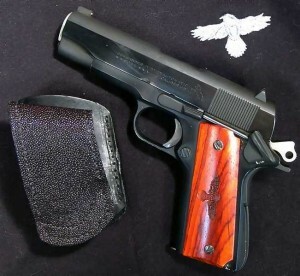 LW Commanders are good guns, no doubt, but I think I’m going to stick with my Springfield Range Officer Compact. It’s a CCO-size, i.e. 4″ barrel on an aluminum Officer’s size frame. Reason being I’m so skinny I make a string bean look overweight, so a Government or Commander size frame prints when I wear anything less bulky than a puffy winter jacket or a shirt that’s two sizes too big. Same for me I always liked the idea of an Officers length and a 4″ slide. Yeah I keep thinking I need to get another Commander-size pistol for carry, but I’m thinking more of a Combat Commander — probably the Colt 1991 series. I inspected one at a LGS recently and it looked really good — of course now it’s gone. But then, I tend to carry a revolver so who knows. My Government model serves as a HD pistol — though I do carry it sometimes in cooler months. I was surprised when Springfield announced the new Range Officer Champion at Shot Show 2015. It looks like a good deal except for the fiber-optic front sight. May have to find a store or show to look at both the Ruger and the Champion. I prefer my LW Government sized 1911, and I’d prefer it more with a Bobtail treatment. 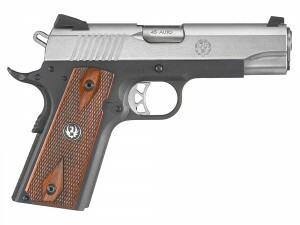 I like the scandium frame two tone bobtail S&W E-series. Great looking blaster and oh my lord does it fit well in the hand. My issue is I have an M&P shield and two 5in sig 1911’s (nickel rail and a tacops) so I don’t “need” it. But the want is so very strong. After years of toying around the idea of getting a 1911 I finally got around to going through many articles, ratings, rants-n-raves, the do’s and dont’s of owning one. Of all the reviews floating around yours was the most down to earth and honest. Taking that read knowledge from your years of seat time with them I went shopping with confidence and picked up my first (entry level) 1911, yesterday. Of all the super fine examples I pervertedly molested and scoured over I settled on the Kimber Pro Carry 2 in .45 auto, two tone black upper with silver bottom and wood grips. Fit, finish, function, size, and trigger…it was all there. My only gripes is that the sights are just yuck, plain black. Knowing the world is not going to end with that I knew the sights were easily changed so it wasn’t a bad selling point. Secondly it only came with one mag, again not a huge deal breaker, just that one would expect at least two…meh, life goes on. As you and many others pointed out you must marry it, I get it now and its understood. Having plugged away at autos for years I kept telling myself to hell with the 1911, to old of a design, a grandpa hand gun, but boy I couldn’t have been more wrong after firing one not long ago. With eyes now wide open my views of a 1911 is different, there is no “instant on” that you can get with modern day autos but I knew this going in and appreciate that, really do, and to that I had to eat crow. The moves must be precise and intentional, to me I love that level of respect it commands.